It’s 12⁰C on 5th Avenue, NY and I’m feeling full of the joys of spring, plus a little jet lagged. Stood outside St Patrick’s cathedral, I look across the road, not to the Art Deco statue of Atlas with the world on his shoulders outside the Rockefeller Centre, but to another Greek god, or goddess, Nike – goddess of victory. At first glance you’d miss it, you could easily walk past it and not know it’s there, unassuming and blending in to the background. If you happen to look up, you’ll see a giant Swoosh, so recognisable as a brand that they don’t need the name on the store. As a marketing geek, I love that the ceiling of the entry to the store is angled at precisely 23.5⁰ which is the exact angle of the Swoosh trademark – genius. Before stepping inside this ‘store of the future’ I knew this was going to be interesting. Walking into Nike House of Innovation feels like you are waiting in line for a ride at a theme park. You are in what they refer to as the Nike Adapt Testing Lab, surrounded by monitors, heat maps, windows with a breakdown of the shoes and all the technology that goes into them. Taking experiential retail to the max, the stand out feature on this floor is the Testing Court – a closed off basketball court where you can try out trainers by playing against a member of staff. 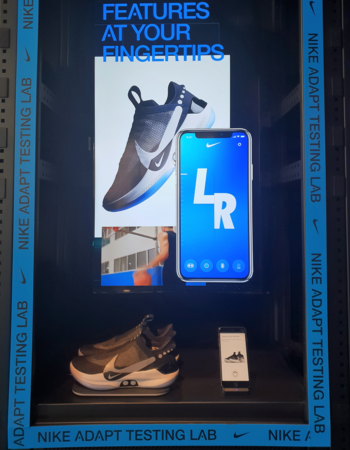 Such a clever way of encouraging sales, the store becomes a destination for the trainer addict, even if the same trainers where available cheaper elsewhere, chances are Nike advocates will make a special trip to this store just for the testing capabilities. On the top floor, the Nike Expert Studio feels a million miles away from the noise and ‘fun’ of the ground floor. A quiet and spacious level, this retail innovation is for the serious shopper. 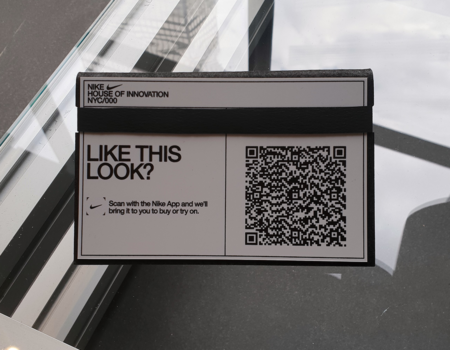 With a design studio, fabrics and outfit creations, booking a session with an expert is the height of personalisation and creativity, with various outfit creations on show, shoppers can scan a QR code via the app, next to the design and a Nike Expert will bring the outfit to you to try or buy. This brings a sense of community to Nike advocates, sharing designs and a common passion for the brand. 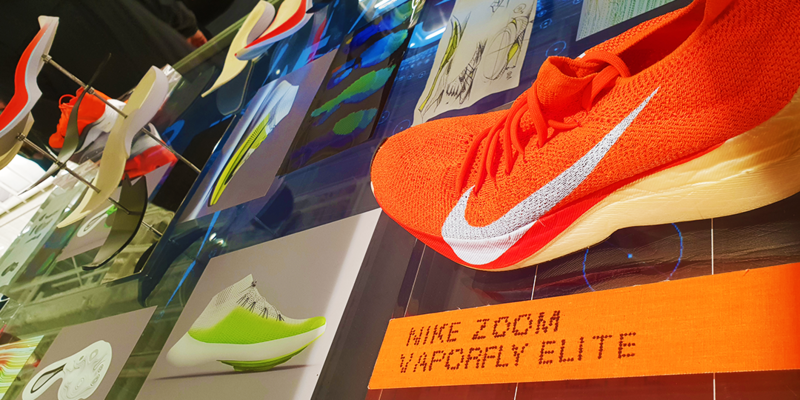 Nike understand that consumers have changed, and this is evident with the in-store technology instantly available to shoppers through its app. Retail innovation and digitalising the consumer shopping experience gives the shopper the power to discover the products they want, at their own pace. Perfect for the nu-wave Gen Z shopper, with research suggesting that 65% of whom find it frustrating when store staff approach them as soon as they get into the store. Self-serve is the trend in this store, combining the ease of online shopping with the tangible aspect of being in-store. With the app you can scan a product and check store stock for your size, with an assistant bringing you the shoes/clothes to try on. But Nike go one further. Via your smart phone you can select the instant checkout option, scan the product barcode, pay with the app, grab a bag and walk out the store. Amazing. An important component with experiential retail is in-store services and this store looks to be a pioneer in the field. In addition to the instant checkout via the app, customers can ‘shop the look’ of any outfits placed throughout the store, providing inclusivity by giving everyone the chance to order a pre-designed outfit. A courier service is also offered which is perfect for tourists who want to spend money and have items delivered to their hotel, or locals who just don’t want to carry around their shopping. In a week where the Environmental Audit Committee has called on the UK Government to make fashion retailers take responsibility for the waste they create, one thing that did stand out was the alterations service. This is a giant step for the future of the store, preventing textile waste and moving closer to becoming more sustainable. I know Nike, along with other big brands have a long way to go to become truly sustainable, but this can help. As he was speaking to me, his enthusiasm for the retail innovation this store has really shone through. He genuinely loved being in that store. It seems strange to talk about innovation and technologies for trainers and athleisure but it’s exciting. Nike have made the normal powerful, dramatic, even mind-blowing and this is where retail needs to be.